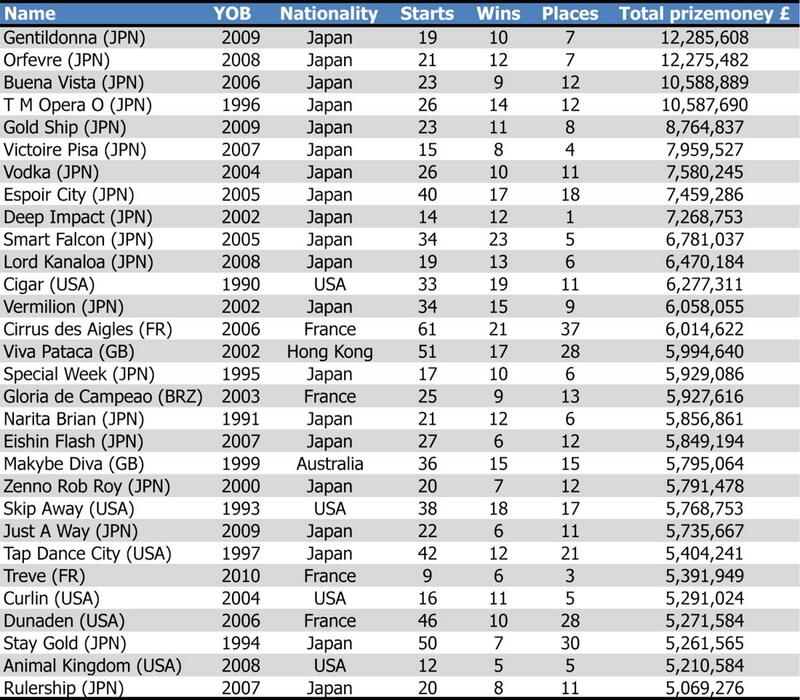 The world’s 11 all-time highest earning racehorses are all Japanese, and only four Americans (Cigar, Skip Away, Curlin, and Animal Kingdom) make it into the top 30, according to authoritative statistics compiled by the International Racing Bureau for Thoroughbred Racing Commentary. The prize money earners’ list is one of two tables the IRB has produced that show quite dramatically how dominant Japanese racing has become in the financial stakes, as James Crispe explains. There is no such thing as a definitive list of the world’s highest-earning racehorses. Why? Because it all depends on what currency you use and at what exchange rate you convert overseas earnings into the chosen currency. The International Racing Bureau is a British company, hence the accompanying list is in pounds sterling. 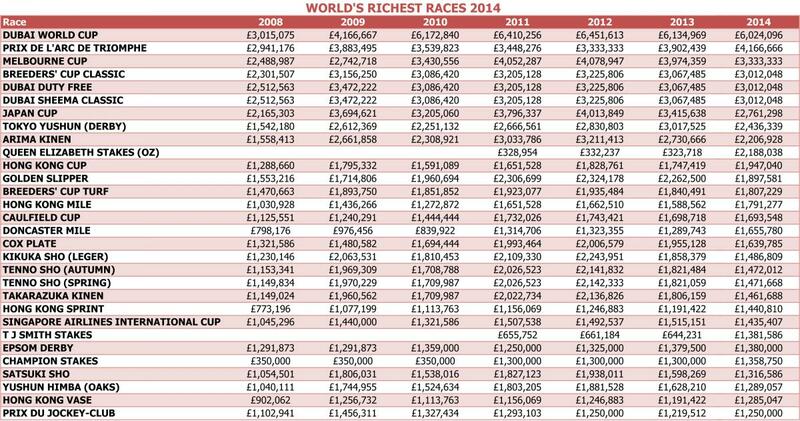 Given that the top British-trained earner of all time, Red Cadeaux, currently has a career bankroll of “just” £4,586,193 and so struggles to make the global top 50, let alone the top 30, maybe pounds sterling is a good currency to choose – you might say that it removes any suggestion of “home advantage” and acts as a neutral venue. The fluctuations of currency exchange rates do mean that any list will be riddled with anomalies. For example, T M Opera O has, according to official Japan Racing Association (JRA) figures, accumulated more Japanese yen in prize money than any other horse – his total of Y1,835,189,000 beats Gentildonna’s haul of Y1,726,030,400. But, because T M Opera O raced at the turn of the century, when the yen was weak, once his career prize money is converted into pounds he fails (by a mere £1,200) to even make the top three in the global standings. Similarly, according to Equibase, Cigar’s career total of $9,999,815 leaves him more than half a million short of Curlin’s $10,501,800 in the race to be America’s top earner. But, since Cigar raced at a time when one dollar would have got you about 67 pence, whereas Curlin’s era was when a dollar was the equivalent of only around 50 pence, Cigar is almost £1 million clear of his fellow countryman in this list. The British Horseracing Authority (BHA) issues a list of official exchange rates during the first week of every calendar year and it is at these conversion rates that all foreign prize money is calculated for the next 12 months. However, currencies can crash or surge, such as the yen in 2008 – its official BHA exchange rate for that year was 222.38 yen to every pound, compared to its 2009 rate of 130.33 yen to every pound. So Buena Vista collected £275,600 for landing a Japanese G1 in mid-December 2008, which if it had taken place three weeks later, would for the purposes of this list been worth more than 70 percent more. Exchange rate discussions aside, Japanese horses dominate the list whichever way you slice it. They fill the top 11 places and two-thirds of the entire list. Click here to see the entire list of the world's highest earners. Some Japanese representatives would be unfamiliar even to ardent racing fans. For instance, the dirt horse Smart Falcon sneaks into the all-time top 10 despite spending almost his entire career plying his trade in National Association of Racing (NAR) contests that are regarded as "local" events, secondary in importance to JRA events. And Stay Gold somehow makes it into 28th place despite having a career win strike rate of just 14 percent. His record in Japanese G1s was a miserable 0 for 19 and he owes his position to having triumphed on his only two forays outside Japan – in the Dubai Sheema Classic and the Hong Kong Vase. How might the list change in the coming months? Fifth-placed Gold Ship is the highest-ranked horse still in training, but he began his 2015 campaign with a poor seventh place at Nakayama on Jan. 15 and needs to increase his tally by approaching £2 million if he is to move up a place on the ladder. So, if the upper echelons of the list are to be reshuffled in the near future, it is likely to be due to the exploits of two near-neighbours from France’s pre-eminent training centre of Chantilly – Cirrus des Aigles and Treve. Already the leading European-trained horse on the list, Cirrus des Aigles is set to embark upon his eighth season of competition in Dubai, and one more big win could see him break into the global top 10. Treve’s 2015 campaign will concentrate on one thing and one thing only - her bid to land a record-breaking third Prix de l’Arc de Triomphe. If she does make history at Longchamp in early October she will also surely become her home continent’s richest racehorse. Japan is the most common venue in a list of the world’s 30 richest races, but the Land Of The Rising Sun is not so dominant here, accounting for less than a third of the races. Dubai is responsible for three of the top six contests, including the most well-endowed, the Dubai World Cup. But the emirate has no more entries in the top 30, leaving Australia as the second-best represented country, with seven entries, just two less than Japan. Worth total prize money of £1,204,819 in 2014, the Kentucky Derby just misses out on a place, as do five Breeders’ Cup events of the same value, meaning that the only American races on the list are the Breeders’ Cup Classic and the Breeders’ Cup Turf. Both Britain and France emulate America with two listings apiece but all three of those famous racing nations lag behind Hong Kong, which has four races in the top 30, plus the world’s 31st richest race in the Hong Kong Derby.